Rakusan did not include the Fan Series in his main sequence numbering. Therefore, the original number used for each of the 36 Series prints has been modified to identify the Fan Series members of its theme. The five different fan silhouette shapes have been here assigned arbitrary numbers 1 through 5. To indicate a fan design these shape designations are added to the 36 Series number separated by a hyphen. 110-4 is the Fan Series design with fan shape 4 in the 110 Persimmon theme. 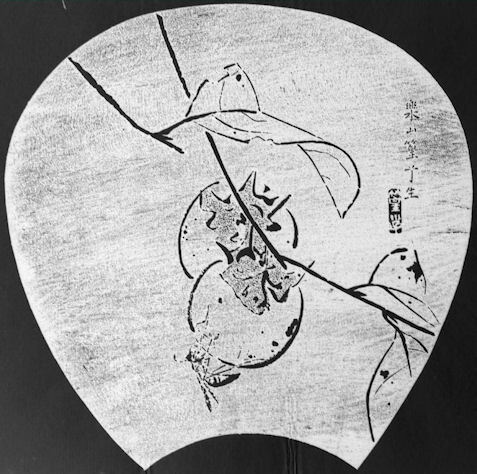 Rakusan used the theme subject title, 柿, kaki, 'persimmon' on the Fan Series delivery documents. Like all other designs in this series, 110-4 was only produced in a single print run, and few copies are currently documented. Edition I: Museum of Fine Arts, Boston, MA, USA; (1950) 50.327 [not illustrated online]. Although seal C is the most used seal in the Fan Series, 110-4 is the only seal C design in this theme. All of the seal C fan designs were created during the second design period in early 1934. 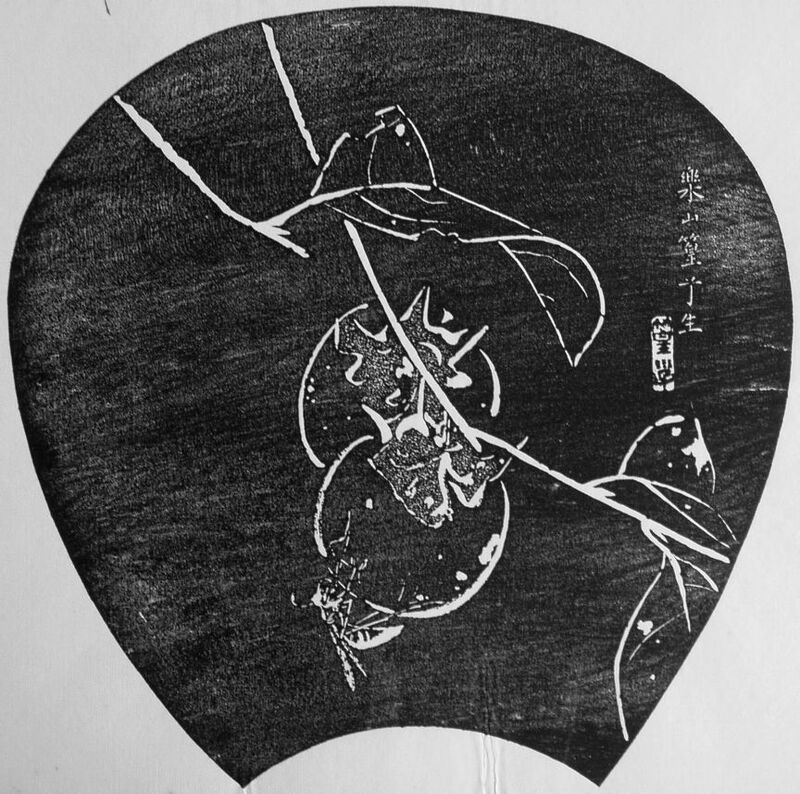 The composition of 110-4 includes two persimmon branches with leaves and two fruit. On one of the fruit sits a wasp hanging below which implies that the persimmons are ripe. 110-4 is a mature and successful design, and all of the design elements are line-drawings which work equally well as drawn or reversed. Note that the calyxes are distinguished with an overall pattern of tiny dots. Wasps and bees share the same name in Japanese, 蜂, はち, ハチ, hachi. The wasp species shown here has not yet been identified more closely.